What spiritual or esoteric practices took place within the mysterious and often controversial Knights Templar? Whilst little is known about this aspect of the Order's history, speculation and wild rumours continue to persist. Having taken the three vows of poverty, chastity and obedience, the members of the Templar Order were required to live the life of other monastic orders. However, their remarkable rise to a successful elite community - followed by the insidious machinations and slander that led to their spectacular fall and destruction - suggests that they were involved in something more significant than straightforward medieval religious practices. There have been many theories as to whether their 'secret' involved material wealth and special treasure. But could it have been connected to a science of initiation - the knowledge, experience and understanding of spiritual dimensions that can enlighten the pupil on an esoteric path? 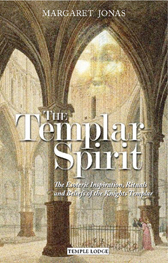 In The Templar Spirit Margaret Jonas penetrates these questions, examining some of the various claims and revealing something of the esoteric practices and beliefs of the Order, including influences from other religious traditions. She presents her own research into the meaning of the mysterious 'head' that the Templars were accused of worshipping, and examines the historical figures that lent their wisdom and guidance to the founding of the Order. MARGARET JONAS was the librarian at Rudolf Steiner House, London, for many years, and has studied anthroposophy since 1975. Â Her special interests include history, religion, astrology, astronomy, literature, the Grail, psychology and states of consciousness.Â She has been researching the Knights Templar for more than 30 years, and is the editor of an anthology by Rudolf Steiner on the subject. She has edited several other anthologies of Steiner's work and has written articles for various journals. She lives in Sussex, England, and has a son.